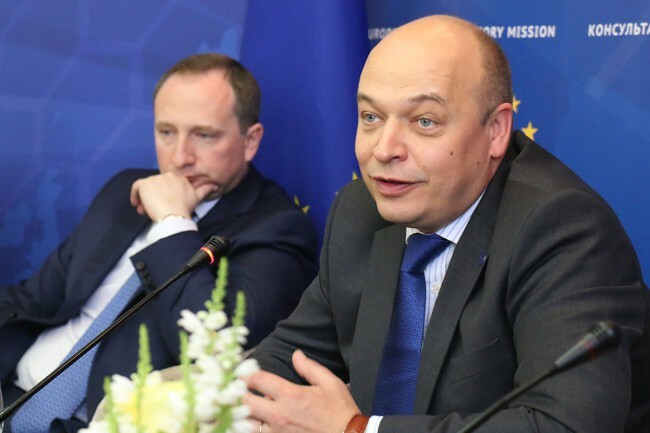 At an event in Kharkiv today, the Head of the European Union Advisory Mission (EUAM) Ukraine Kęstutis Lančinskas outlined the Mission’s enhanced activities in the city and surrounding region. Activities to take place this summer include a major training programme in community policing as well as a project to boost capacity in criminal investigations. These will be coordinated by a team based in Kharkiv, led by experienced Dutch policeman Gerrit Jan van Gelder. Mr Lančinskas noted that the Mission has already been active in the Kharkiv region, delivering in recent months workshops on how to improve cooperation between criminal investigators in the police and prosecutors, international cooperation in police matters, investigation of money laundering and crisis communication. He underlined that the successful Sambir Project, carried out with the Lviv regional police in summer 2015, would be the basis for a ‘model police station’ planned for Nova Vodolaha. The Sambir Project managed through a mix of strategic advice, reallocation of resources, and training to bring down police response times to six minutes in urban areas and 22 minutes in rural areas. It is EUAM’s ambition to achieve similar successes in the Kharkiv region. EUAM’s partners in the Kharkiv region were present in number, with speeches given by Igor Raynin, the Head of the Kharkiv State Regional Administration, Serhiy Chernov, the Head of the Kharkiv Regional Council, Igor Terehov, Deputy Mayor of Kharkiv, Gen. Maj. Anatoliy Dmytriev, Acting Head of National Police in the Kharkiv Region and Yuriy Danylchenko, Prosecutor of the Kharkiv Region. The event in Kharkiv followed a similar ceremony last Friday in Lviv, where EUAM also announced increased activities.